The Pinnacle SL300 Stair Lift is competitively priced with plenty of value. Very compact, it runs smoothly, and requires little to no maintenance. The Pinnacle Stair Lift has an established reputation as an industry leader for its innovative design, solid performance and reliability. It’s patented drive system serves as the cornerstone that makes this stair lift different from all others on the market. The SL300 gives you peace of mind knowing it’s efficient motor offers extended performance during power loss, up to 40 trips up and down. Owners of this stair lift will enjoy a smooth stable ride due to its patented Helical Worm Gear and Nylon Polymer Gear Rack. 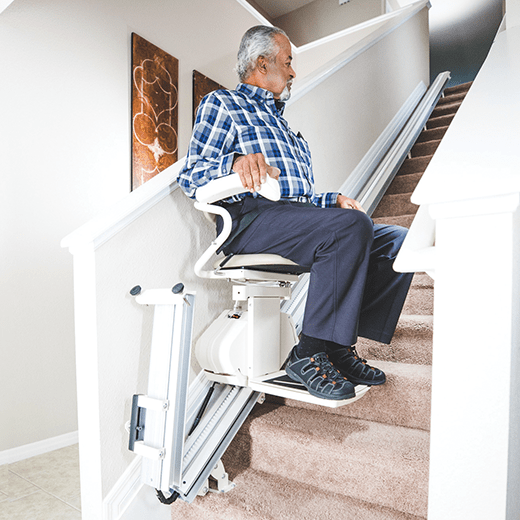 Pinnacle is the most compact of stair lifts, folding closer to the wall so others can pass easily. Harmar’s exclusive automatic and mechanical folding rail removes obstructions and trip hazards at the lower landing area. Its operation is automatic, the user does not need to stop or have someone else assist. And since it’s mechanical, there are no additional switches or controls.